NASA's Dawn spacecraft snapped this photo of the huge asteroid Vesta on July 9, 2011. 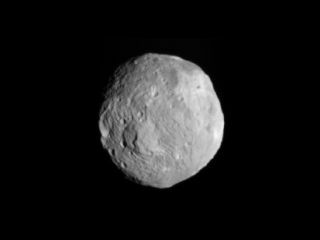 It was taken from a distance of about 26,000 miles (41,000 kilometers) away from Vesta. NASA's Dawn spacecraft should now be circling the massive asteroid Vesta — if everything went according to plan. Dawn was slated to slip into orbit around Vesta, the second-largest object in the main asteroid belt, at 10 p.m. PDT Friday (July 15; 1 a.m. EDT Saturday). So the probe has likely begun its yearlong orbital mission at the huge space rock, but scientists will have to wait a day or so to find out for sure. Dawn has been thrusting with its ion engines for several days straight. The probe generally cannot communicate with mission controllers while it's thrusting, because its antenna is pointed away from Earth during these stretches. But the spacecraft is due to re-orient and check in with the mission team at about 11:30 p.m. PDT Saturday (2:30 a.m. EDT Sunday), researchers said. Even if something went wrong and Vesta did not capture Dawn late Friday, mission scientists would not panic. They could just try again, since Dawn has simply been pacing Vesta in its orbit around the sun. "We've always got the ability to catch up," Mase told SPACE.com. The $466 million Dawn mission is the first one ever to make a prolonged visit to a large asteroid. And Vesta is indeed large; at 330 miles (530 kilometers) across, it's so big that many astronomers classify it as a protoplanet. Vesta would have continued growing into a full-fledged rocky planet like Earth or Mars, scientists say, if Jupiter's gravity hadn't stirred up the asteroid belt long ago. Dawn will study Vesta from above for a year, scrutinizing the space rock from three different orbits. Then, in July 2012, it will move on, heading for the dwarf planet Ceres. At 590 miles (950 km) wide, Ceres is the largest body in the main asteroid belt between Mars and Jupiter. Dawn will perform similar investigations at Ceres. The mission's main goal is to compare and contrast Vesta and Ceres, which are very different objects despite occupying relatively similar regions of space. Ceres is more primitive and wet, possibly harboring water ice, while Vesta seems to be more evolved and drier, researchers have said. The spacecraft's observations could help researchers learn about the solar system's early days, as well as the processes that formed and shaped rocky planets such as our own. NASA approved the Dawn mission in 2001, canceled it in March 2006, then reinstated it just weeks later. The probe launched in September 2007 and has covered more than 1.7 billion miles (2.7 billion km) since.